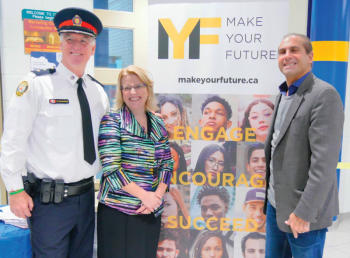 Make Your Future 2 (MYF2) will happen on April 25th at Westview Centennial Secondary School from 11 a.m. to 2:30 p.m.
It’s a combination job fair/post-secondary information event and will feature exhibits from numerous private and public sector organizations. Some are currently looking to hire young people while others offer training for specific sectors which are hiring immediately and others are offering guidance and information on how Grade 11 and Grade 12 students can plan a successful career path. I recently caught up with Inspector Colin Greenaway of 31 Division. The Inspector is one of the driving forces behind this wonderful event. EVV: Tell us what your anticipating for the program, and what you're excited for? EVV: The idea was let's get some job opportunities in front of youth? EVV: And your personal goals?